The services.AddIdentity() method accepts IdentityOptions object, whose ‘Password’ property that returns PasswordOptions object, can be used to enforce the password policy. 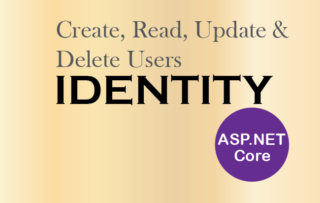 Before you continue this tutorial I ask you to read my previous tutorial on How to Create, Read, Update & Delete users in Identity Membership System in ASP.NET Core. This is because here I update the same codes to create my policies. RequiredLength Use this property to provide the minimum length of the password. 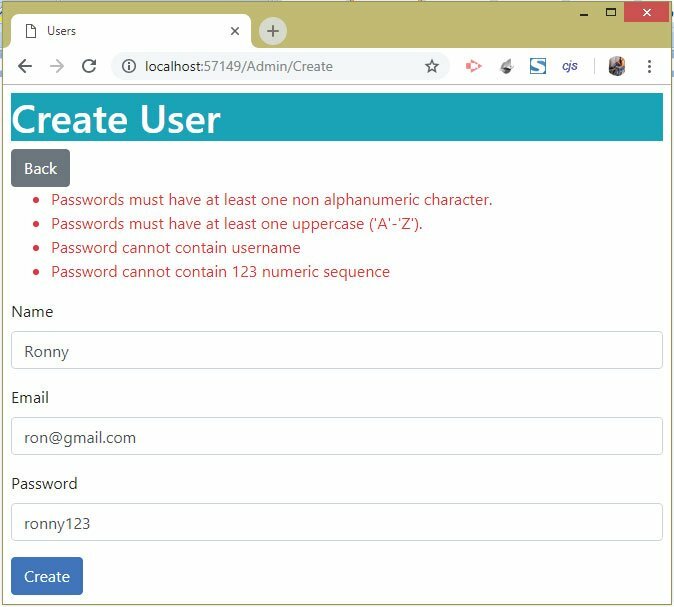 RequireNonAlphanumeric When you set this property to true then Identity will require at least one character in your password that is not a digit or a alphabet. RequireLowercase When you set this property to true then Identity will require at least one lowercase character in the password. RequireUppercase When you set this property to true then Identity will require at least one Uppercase character in the password. RequireDigit When you set this property to true then Identity will require at least one digit in the password. 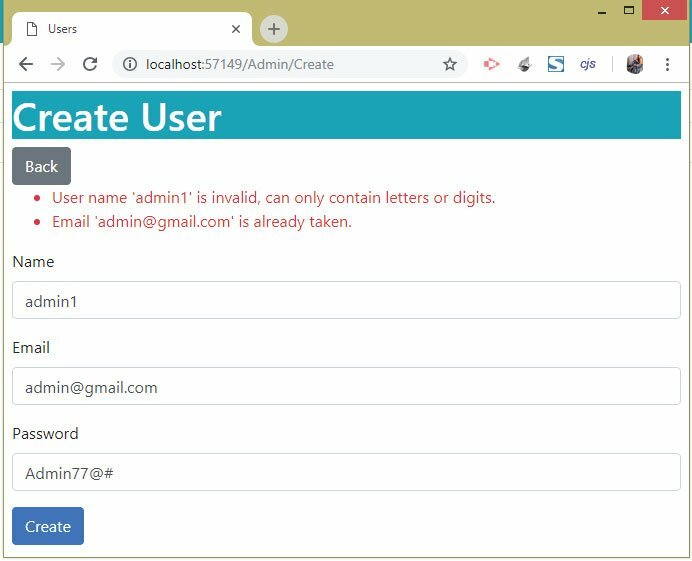 You can now test it by going to the URL – ‘/Admin/Create’ and try creating a new user account by giving the name as ‘admin’, email as ‘[email protected]’, and a weak password as ‘secret’. Now change the password to ‘[email protected]’. Since it satisfies the password criteria so this time you will be able to create the new account. You can also build your own Custom Password Policy for the Identity System. You can do it by inheriting the PasswordValidator class. Description = "Password cannot contain username"
Description = "Password cannot contain 123 numeric sequence"
I have inherited my class from the PasswordValidator class which defines ValidateAsync method. I have override the ValidateAsync method in my class, and inside this method I am implementing my custom password policy. 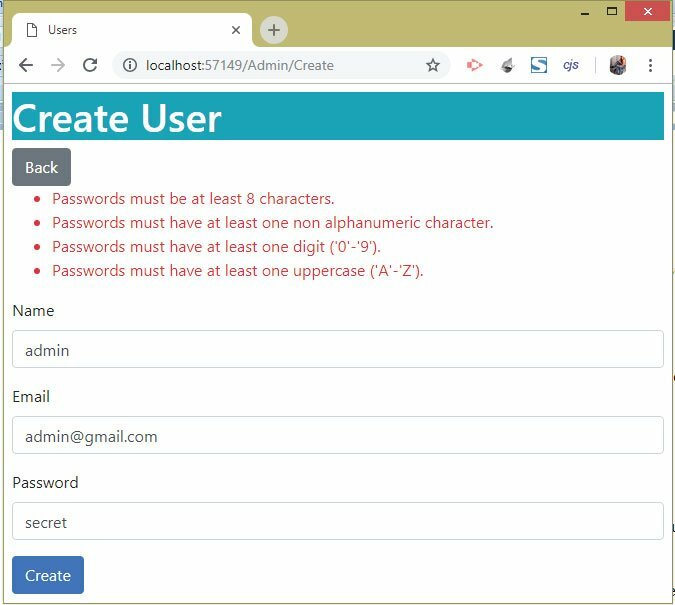 The first code line – IdentityResult result = await base.ValidateAsync(manager, user, password); validates the password according to the password rules given in the ConfigureServices method of Statup class (see the above section). It then gives me an IdentityResult object. Finally in the last line of code – return errors.Count == 0 ? IdentityResult.Success : IdentityResult.Failed(errors.ToArray());, I am checking the count of the errors, if the count is 0 then I return ‘IdentityResult.Success’ else ‘IdentityResult.Failed’ with the errors in an array object. These errors come from the ‘CustomPasswordPolicy’ which validates the password based on the policy I implemented. Just like what I did for Password Policy, I can also configure the Startup class for Username and Email Policies. These are done using the IdentityOptions.User property, which returns an instance of the UserOptions class. By setting the RequireUniqueEmail property to true, I enforce that no 2 users in my Identity database can have the same email address. The next property which I used is the AllowedUserNameCharacters. I have set a list of characters that can only be used when creating a username in Identity. 1. User name ‘admin1’ is invalid, can only contain letters or digits. 2. Email ‘[email protected]’ is already taken. 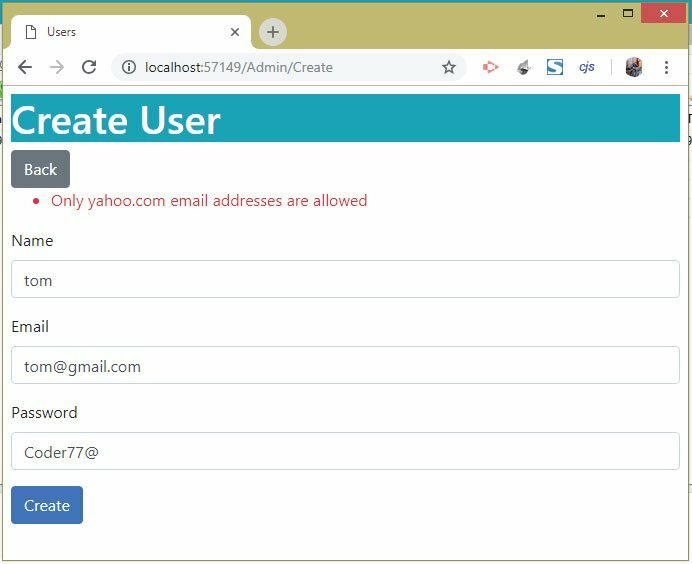 To create a custom Username and Email policy you will need to use the UserValidator class which provides the validation service for usernames and emails. So create a new class called ‘CustomUsernameEmailPolicy’ and inherit it from UserValidator class. Override the ValidateAsync method to check if the email entered is of yahoo.com or not. If the email is not from yahoo.com then I add an error to List object. Description = "Only yahoo.com email addresses are allowed"
The error comes because my custom email validation comes to play and prevents from adding a gmail.com email address. 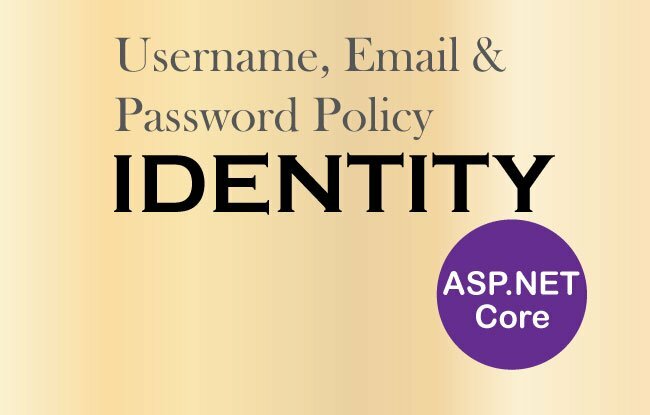 You will notice that your Password, Username and Email Policies, which you added in the above sections, will not be automatically applied to when updating a user in Identity. This you can confirm by running your application and clicking the ‘Update’ link against any of the User record. When the user’s record opens for updating purpose, put ‘123’ for the password and click the save button. 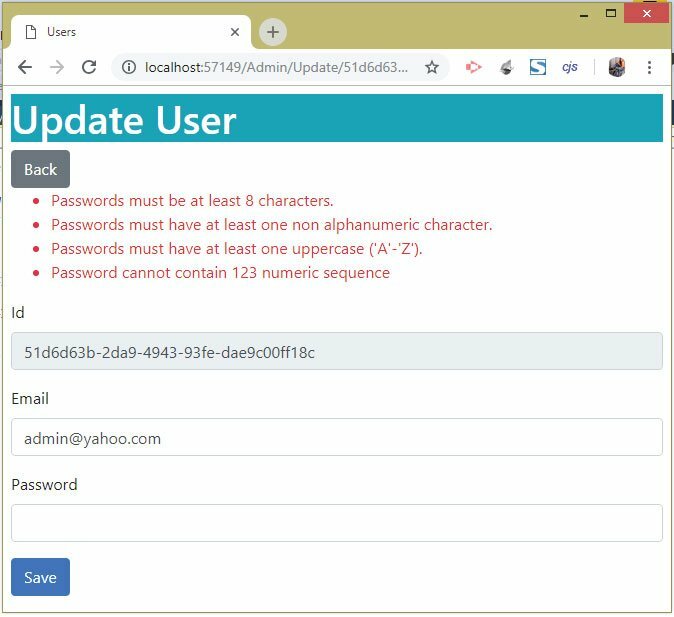 You will notice that the user account gets updated and you did not get the error saying – Password cannot contain 123 numeric sequence. This completes this tutorial and now you are in a position to create your own custom policies in Identity Management System.